Coffee shop on the High Street. It originally opened in May 2015, but closed in early 2017 for a refurbishment and a change of management. It reopened in late March 2017 under the new management and with a different menu. The premises were previously occupied by a barber and men's hairdresser called Angelo & Lino photo, but this moved around the corner to 1 Robert Street in early March 2015 photo of sign. 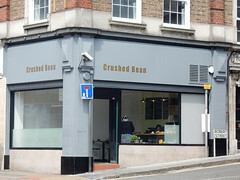 As of April 2015 there was refurbishment work going on inside, and by mid-May 2015 a coffee shop called Crushed Bean had opened. This closed in February or March 2017 for a refurbishment and a change of management photo of sign in window, and reopened again with the new management and a different menu in late March 2017. Last edited 2019-03-26 14:30:07 (version 48; diff). List all versions. Page last edited 2019-03-26 14:30:07 (version 48).